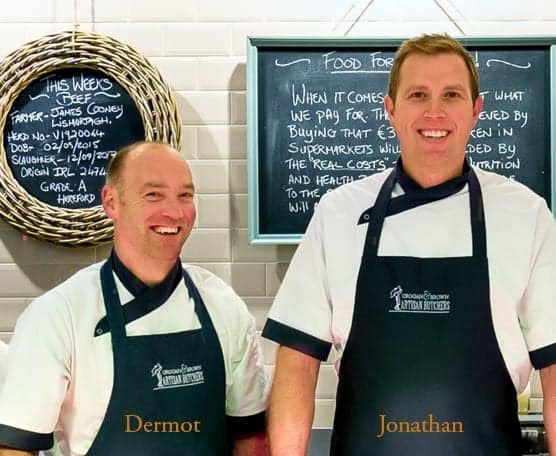 Jonathan Brown and Dermot Grogan, two local Kilkenny butchers, have been honing their butchery skills over a combined 40 years. 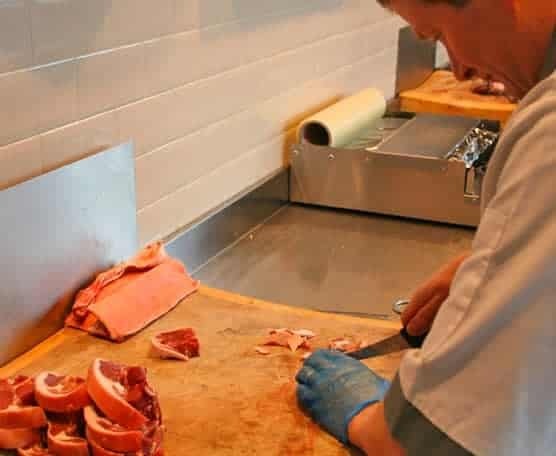 They share a passion for butchery, sourcing high quality produce supporting local farmers and artisan producers. 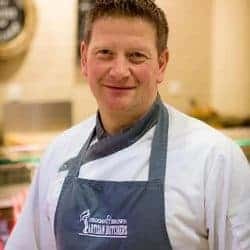 Both Jonathan and Dermot are experienced butchers with a true understanding and dedication to the farm to fork ethos of butchery. They have a network of contacts that enables to them to procure animals from local farmers and to process these animals to offer the local community a truly traceable superior local Irish product. They also are very experienced in terms of dry aging beef and seek to educate the customer on this process so that they can make an informed choice and understand the true difference in the premium product offered by the butcher both in terms of taste and texture compared with a supermarket for nominal if any difference in price. Qualified and highly experienced butchers Brian Bourke, Clive Moriarty and Wayne Walsh complete the team in G&B. The team in G&B are familiar faces to the Kilkenny locals, whose commitment to customer service is renowned. They listen to their customer, understanding their individual likes and dislikes, guide them through cut selection so that they can choose the best product for the given dish, understand how to cook it so that others can enjoy the pleasurable merits of good food and good cooking. Jonathan is one half the Grogan and Brown duo. For those who know him they know that he has a passion for good food, good produce and supporting local suppliers. 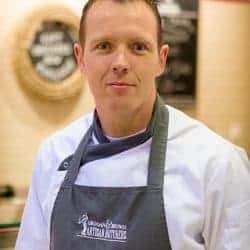 He has featured on the main stage at the Savour Kilkenny Food Festival and TV3 and is keen to share his skills and knowledge in meat selection and preparation. 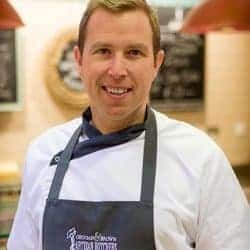 He is on hand to guide and advise our customer on speciality fare from grouse to veal to vension or traditional Sunday roasts! His knowledge is extensive and his passion for food is contagious! Dermot completes the G&B duo. With over 20 years butchery experience he is as comfortable on the counter as in an abattoir. He is our resident sausage making expert whose speed and skill in hand linking sausages is renowned. Indeed he truly exemplifies the farm to fork ethos and at the weekend he can be found on his family’s farm in Kilkenny. He is always quick with a smile and a broad welcome. He is known for his quick step both on the hurling field as well as the Strictly come dancing dancefloor! 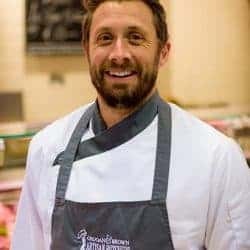 Our Clive has butchery in his DNA, hugely talented, and comes from a long line of butchers throughout his family; he is the engine of G&B, and head of our production team. Very methodical in his approach to whatever task is set out for him, and always thinking outside the box. Not only is Clive a talented butcher, but indeed a very accomplished ballroom dancer! 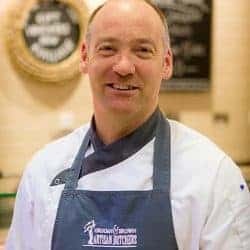 A talented Craft Butcher, with almost 30yrs experience, our Brian has a great eye for detail, meticulous in his work, customer focused with a can do attitude. It comes of no surprise that Brian is a past winner for excellence in customer service awarded by Kilkenny Chamber of Commerce. You’ll hear him singing before you’ll see him! The most recent addition to our team at G&B, with over 20yrs experience as a qualified butcher. Wayne is a very popular and familiar face from his time working in Superquinn, renowned for his superb customer service. Both Wayne and Brian make up the core of our front of house team at G&B. We call them “The Dream Team!” You won’t find better!